Camp meals are served buffet style with lots of food choices. Campers sit with friends from their cabin and can eat as much as they like. Breakfast offers a variety of cereals, fruit, juice, milk, yogurt and a hot entree'. Lunch is usually lighter with sandwiches, both hot and cold, fruit, chips and drinks. Dinner is everyone's favorite with meals including Lasagna, Homemade Pizza, fresh smoked BBQ, General Tso’s Chicken and Stir-fry, Taco Bar, Spaghetti, Cheese Tortellini and more. 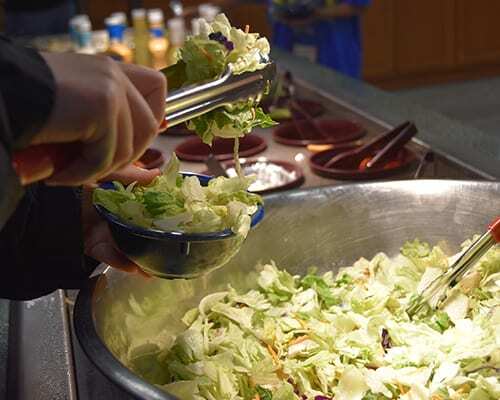 A salad bar is available with both lunch and dinner. We have found that even the pickiest of eaters can find something they like at every meal. 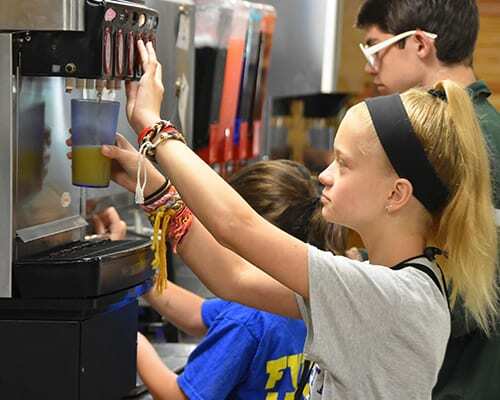 If a camper isn’t able to find something on the hot or cold food bar that appeals to them, they still have other choices available. We have several kinds of fresh fruit available at every meal, as well as bread, bagels, English muffins, peanut butter and jelly and a breakfast cereal bar. If none of these options work campers can microwave a baked potato, mac n' cheese or ramen noodles. We also have chocolate milk, 2% milk, real fruit juice and several kinds of Kool-aid available at all meals. Every session, we have campers with all sorts of food preferences and requirements. Even though we are not able to “make” special meals, we work hard to ensure that all campers have food choices available. As campers enter our dining hall, they will walk past a small gift shop that has both refrigerators and freezers, full of possible substitution options. Here campers will find, soy and almond milk as well as gluten free, dairy free and meat free foods. Campers can use money from their camp store account to purchase any food substitutions that they may need. The dining hall has a special gluten free toaster oven and a peanut free counter for campers to use if they have a need. 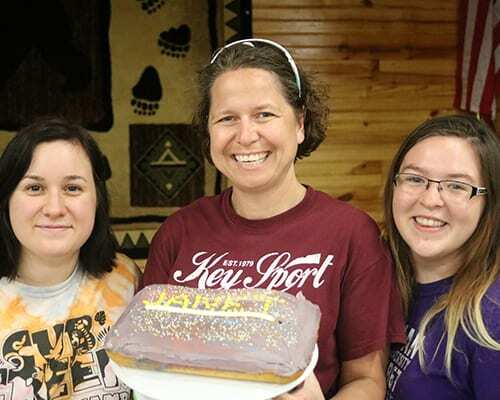 Campers with dietary restrictions are also welcome to bring food from home. All food brought from home should be clearly labeled with the campers name and cabin. These foods will be kept in a special refrigerator in our kitchen.